January 29, 2019 / TheNewswire / Vancouver, Canada - Guyana Goldstrike Inc. (the "Company" or "Guyana Goldstrike") (TSXV: GYA, OTC: GYNAF, FSE:1ZT) is pleased to report that the technical team has made a second discovery of quartzite-metachert (host rock) northeast of Toucan Ridge, on its Marudi Gold Project ("Marudi" or the "Property") located in the Guiana Gold Belt, Guyana, South America. A large quartzite-metachert (host rock) outcrop was identified. This outcrop is approximately 2,300 metres northeast of Toucan Ridge trench TTR-18-06 which is the westernmost trench at the Toucan Ridge area. It is also approximately 1,100 metres northeast of Toucan Ridge trench TTR-18-15, which is the location of a previously reported discovery of host rock at surface. 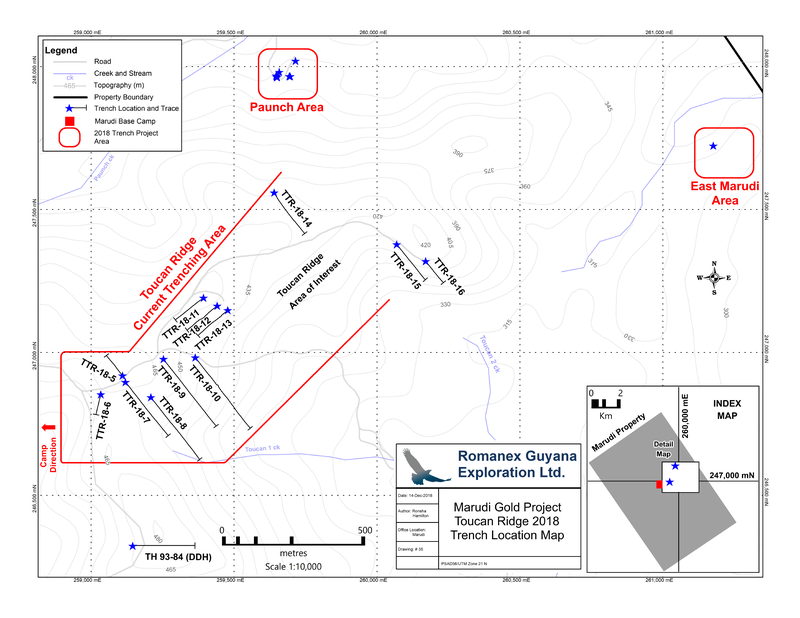 Please see the news release dated November 28, 2018 "Guyana Goldstrike Announces New Discovery of Quartzite-metachert (Host Rock) 350 metres East of Trench TTR-18-15, at Toucan Ridge, Marudi Gold Project, Guyana" for more details. The technical team is of the opinion this discovery may present a new zone of potential gold mineralization and is geologically distinguishable from Toucan Ridge. This new area has been termed "East Marudi". Please view the "Location Map" below, for the location of the East Marudi discovery site, plus all trenching at Toucan Ridge that has been announced to date. For further information regarding the resource estimates, readers are encouraged to review the technical report "Marudi Property Mazoa Hill Mineral Resource Estimate", available under the Company's profile on SEDAR. At Marudi, all important gold mineralization discovered to date is associated with the medial quartzite-metachert (host rock) unit of the Marudi Mountain Formation. Gold occurs within the magnetite-hematite rich quartzite and in the magnetite-silicate iron formation. Mineralization of the host rock may be affected at surface by the erosion at different levels of the strata. Therefore, all discoveries of quartzite-metachert on the Property are considered important for the potential of containing mineralization at surface and/or at depth and should be explored through trenching and drilling. Gold mineralization at Marudi is regarded as being related to iron-formation-hosted gold ("IFG") deposits that occur in other cratonic greenstone belts around the world. These deposits can be remarkably long-lived with sizeable gold production. They have a strong association between gold and iron sulfide minerals, the presence of gold bearing quartz veins and structures, the occurrence of deposits in structurally complex terranes, and the absence of lead and zinc enrichment. The Company also announces that it intends to extend the expiry date of an aggregate of 4,752,502 previously issued common share purchase warrants (the "Warrants") for an additional twenty-four months (the "Amendment"). A portion of the Warrants (4,283,752) were issued in connection with a private placement completed by the Company on March 9, 2017 and are exercisable at a price of $0.30. The balance of the Warrants (468,750) were issued in connection with the acquisition of Romanex Guyana Exploration Ltd. and are exercisable at a price of $0.20. Under the terms of the Amendment, the expiry date of the Warrants will be extended to March 9, 2021. The Amendment remains subject to the approval of the TSX Venture Exchange. There has been 42,000 metres of historic diamond drilling (141 holes) completed on the project by prior operators that have delineated two zones of mineralization: Mazoa Hill and Marudi North zones. The Company has recently completed a mineral resource estimate on the Mazoa Hill zone containing 259,100 indicated gold ounces within 4,428,000 tonnes grading 1.80 g/t and 86,200 inferred gold ounces within 1,653,000 tonnes grading 1.60 g/t. The Company has recently discovered a third mineralized zone: Toucan Ridge. This zone is the current focus of the Company's 2018 trenching program. There exists excellent exploration upside for the further discovery of mineralized zones through the development of previously and newly identified mineralized bedrock targets on the project. For information concerning the mineral resource estimate and the project, readers are encouraged to review "Technical Report: Marudi Property Mazoa Hill Mineral Resource Estimate", a technical report prepared for the Company by Global Mineral Resource Services and is available at Click Here and under the Company's profile on SEDAR www.sedar.com. Guyana Goldstrike Inc. is a Canadian based junior gold company focused on the exploration, development, and operation of the Marudi Gold Project in Guyana, South America. The Republic of Guyana is located in South America adjacent to Suriname. The country is English speaking and under British Common Law with a democratically-elected government. It has an established mining act and a rich history of gold production. In 2016, 690,000 ounces of gold was produced by operators mining in the country. The Fraser Institute's 2016 Annual Survey of Mining listed Guyana as the third best mining jurisdiction with regards to investment attractiveness in the Latin America and Caribbean Basin sub-group. The Guiana Shield is the geographic gold-hosting region, and is world-recognized as a premier gold region that is highly prospective, under-explored and has geological continuity with West Africa. * In 2016, two mines in Guyana declared the commencement of commercial production: the Aurora deposit (Guyana Goldfields) and the Karouni deposit (Troy Resources). Locke Goldsmith, M.Sc., P. Eng, P. Geo, Chief Geologist and Exploration Manager for the Company, is a Qualified Person in accordance with National Instrument 43-101 - Standards of Disclosure for Mineral Projects. Mr. Goldsmith has reviewed and approved the scientific and technical content of this news release. This news release may contain certain "Forward-Looking Statements" within the meaning of the United States Private Securities Litigation Reform Act of 1995 and applicable Canadian securities laws. When used in this news release, the words "anticipate", "believe", "estimate", "expect", "target, "plan", "forecast", "may", "schedule" and other similar words or expressions identify forward-looking statements or information. These forward-looking statements or information may relate to future prices of commodities, accuracy of mineral or resource exploration activity, reserves or resources, regulatory or government requirements or approvals, the reliability of third party information, continued access to mineral properties or infrastructure, fluctuations in the market for gold, changes in exploration costs and government regulation in Guyana, status of artisanal mining activities and associated rights, and other factors or information. Such statements represent the Company's current views with respect to future events and are necessarily based upon a number of assumptions and estimates that, while considered reasonable by the Company, are inherently subject to significant business, economic, competitive, political and social risks, contingencies and uncertainties. Many factors, both known and unknown, could cause results, performance or achievements to be materially different from the results, performance or achievements that are or may be expressed or implied by such forward-looking statements. The Company does not intend, and does not assume any obligation, to update these forward-looking statements or information to reflect changes in assumptions or changes in circumstances or any other events affections such statements and information other than as required by applicable laws, rules and regulations.